Read our detailed and comprehensive prediction on who will win today? In Today’s Dream11 Fantasy Cricket Match Prediction of KKR vs SRH Qualifier 2, IPL, we will cover likely playing 11, pitch report of Eden Gardens, Kolkata, and toss prediction. We will also cover dream11 guru and crictom prediction, players recent and past performance, weather report of Kolkata, all the latest news and details of Kolkata Knight Riders and Sunrisers Hyderabad, dream 11 best teams, key players, the best choice for captain and vice-captain, where to watch live match of SRH vs KKR and details of live streaming. All the details in this post are taken from very reliable sources. Make sure to read the complete post to get 100% benefit. Each and every section of the post has some important tips, tricks and suggestion on fantasy cricket, so make sure to read the complete post. All the details in this post are completely free of cost. You don’t have to pay a single penny. Our strategy is very much simple. We predict, the players perform and you win. So to win you need to have the above details and the best part is we provide the complete details. You just need to give a couple of minutes in this post and make perfect winning teams for any fantasy leagues like dream11 and myteam11. 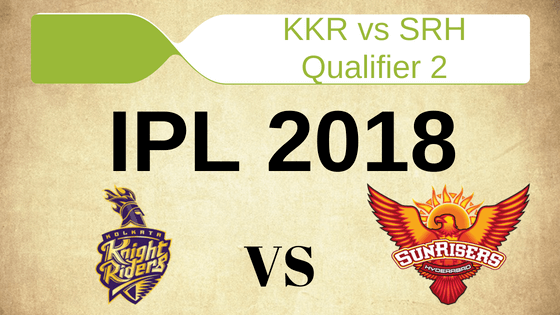 Who Will Win the Qualifier 2 of IPL 2018 Between KKR vs SRH and Toss Prediction? What is the best combination of players for Dream11 in Qualifier 2? Date: The match will be played on 25th May 2018 (Friday). The pitch of Kolkata, Eden Gardens behaved totally different in the last game and it was due to rain and moisture on it. There was no rain in Kolkata since yesterday, so the pitch is expected to be dry and will favour the batsmen. It will also have something for the seamers in the initial overs and the spinners will also get help from the pitch as the match passes. The Fast bowlers took 48 wickets and the spinners took 51 wickets in the last eight matches played on this ground. You can see the data and can easily figure out that the seamers and the spinners also have something on this wicket. Partly cloudy, sunny, clear and mostly clear. This is how the weather will behave today. Most of the time the sky will be clear. No rain is expected today. Cricket fans and fantasy users can watch the complete game. The temperature is expected to be 30-Degree Celsius and the humidity to be 73% which may rise up to 84%. Note: If you know about the weather then you can make some idea about the pitch and how the wicket will behave. The weather plays a very important role as it determines that how the pitch will behave and this helps dream11 users to select their teams accordingly. In the last five matches, KKR has won three matches out of five matches whereas SRH has won two games out of five games. In this IPL season both the teams have won one game each. In overall encounters, Sunrisers Hyderabad has won 5 matches and Kolkata Knight Riders have won 9 matches. At this venue, KOL won 5 games and HYD won 1 game. Note: If you have teams previous clash record then you can easily know which team can win. When we analyzed the previous trend we found that both the teams have won in alternate matches. So it is very likely that SRH will win today as KKR has won the last match. Star Sports has paid a huge amount of INR 16,347.50 Crores to get exclusive rights of IPL 2018 for live coverage for five years starting from 2018 to 2022. Star Sports has all the media rights including TV and all Digital Rights. You can watch the full match of Sunrisers Hyderabad vs Kolkata Knight Riders (Qualifier 2) on Star Sports. Kane Williamson (c), Shakib Al Hasan, Shreevats Goswami (wk), Mohammad Nabi, Mehdi Hasan, Shikhar Dhawan, K Khaleel Ahmed, Manish Pandey, Bhuvneshwar Kumar, Yusuf Pathan, Basil Thampi, Carlos Brathwaite, Chris Jordan, Siddarth Kaul, Tanmay Agarwal, Rashid Khan, Ricky Bhui, Sandeep Sharma, Sachin Baby, Wriddhiman Saha, Alex Hales, T Natarajan, Deepak Hooda, Bipul Sharma. Chris Lynn, Dinesh Karthik (c & wk), Prasidh Krishna, Sunil Narine, Ishank Jaggi, Tom Curran, Robin Uthappa, Javon Searles, Nitish Rana, Shivam Mavi, Kuldeep Yadav, Shubman Gill, Vinay Kumar, Andre Russell, Apoorv Wankhade, Piyush Chawla, Cameron Delport, Mitchell Johnson, Rinku Singh. Both the matches of playoffs was a heart throbbing game and was last over finish but the result for both the teams was different. SRH lost their last matches, even they lost their last four matches in a row. On the other hand, KKR has won their last four matches. It will be interesting to how both the teams make their playing 11 combinations. We will give you the probable playing 11 of both the teams in the next section. Why fix if nothing is broken. Kolkata Knight Riders have won their last four matches and they are in good touch. Dinesh Karthik will most probably play with the same playing 11 until and unless there is any fitness issue. Sunil Narine, Nitish Rana, Andre Russell, Javon Searles, Piyush Chawla, Chris Lynn, Robin Uthappa, Dinesh Karthik (capt & wk), Shubman Gill, Kuldeep Yadav, Prasidh Krishna. It would be a very difficult situation for Sunrisers Hyderabad as SRH have lost their last four matches back to back. It’s just the matter of a game and again they will be back to their momentum. Although, HYD lost their last their match against CSK but they will play with the same playing 11 until and unless there is any serious fitness issue. Shikhar Dhawan, Kane Williamson (capt), Shakib Al Hasan, Carlos Brathwaite, Bhuvneshwar Kumar, Sandeep Sharma, Shreevats Goswami (wk), Manish Pandey, Yusuf Pathan, Rashid Khan, Siddarth Kaul. Note: To win in any fantasy league, the first thing you should have a team where all your players play and for this, you should have a fair idea of playing 11 of both the teams. If you have an idea about the perfect playing 11 then you are ahead of 70% of your competitors. Pro tips: You can take Dinesh Karthik over Goswami as Karthik is in great form. Make a combination of above players for multiple teams. Pro tips: The above batsmen are most likely to score runs today. Make a combination of the above batsmen for multiple teams. Pro tips: The above bowlers are most likely to take wickets. Make a combination of the above players. Pro tips: The above players are most likely to perform today. You can take them as a captain and vice-captain. You can also take captains from playing 11. If we look at the previous record of last five matches, both the teams have won alternate matches. Kolkata Knight Riders have won the last match against Sunrisers Hyderabad and it is our assumption that SRH will win today’s match according to the trend. According to our astrology prediction, SRH will win today. The team winning the toss will opt to bowl first and according to our astrology prediction, Sunrisers Hyderabad will win the toss and opt to bowl first. Try to keep Andre Russell, Kane Williamson, Sunil Narine and Dhawan in your team. Taking three all-rounders in your team would be a wise choice. Try to make a team considering a fact that all the departments will get some help from the pitch. Conclusion: This is it for Today’s Dream11 Fantasy Cricket Match Prediction of KKR vs SRH, Qualifier 2, T20 Match, IPL 2018 which will be played on Friday 25th May. You can give your valuable feedback in the comment section. Subscribe to our notification of latest updates. GOODBYE! we have check your today team but not clear . please urgent upload dream 11 team . It will be updated in 5 mins.